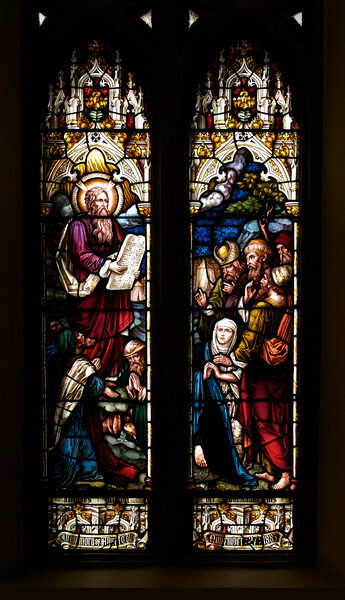 This is an Old Testament window, the lower portion shows Moses giving the Law. Clement Heaton originally founded his stained glass firm in 1852, joined by James Butler in 1855. Between 1859-61 they worked alongside Clayton and Bell and were joined by Robert Turnill Bayne, who became their sole designer and a full partner in the firm from 1862. His windows show strong design and color, and are often recognizable by the inclusion of at least one figure with Bayne's features and long beard to Wikipedia.. They established their studio in Covent Garden, London, and went on to become one of the leading firms of Gothic Revival stained glass manufacturers, whose work was commissioned by the principal Victorian architects. A change in direction came with their production of windows to the designs of Henry Holiday in 1868, which show a more classical influence at work. During a long career, the firm produced stained glass for numerous churches throughout the U.K. and the U.S. The early 19th century was marked by a renewal of the Christian faith, a growth of Roman Catholicism, a planting of new churches, particularly in centers of industrial growth and the restoration of many ancient churches and cathedrals. In the 1850s a number of young designers worked in conjunction with the leading Gothic Revival architects in the provision of stained glass for new churches and for the restoration of old; the work of John Richard Clayton, Alfred Bell, Clement Heaton, James Butler, Robert Bayne, can be found in Incarnation.